No summer is complete without spending time out boating on the water. Most think of tubing when thinking of fun water sports to use with your boat but the possibilities go far beyond that. 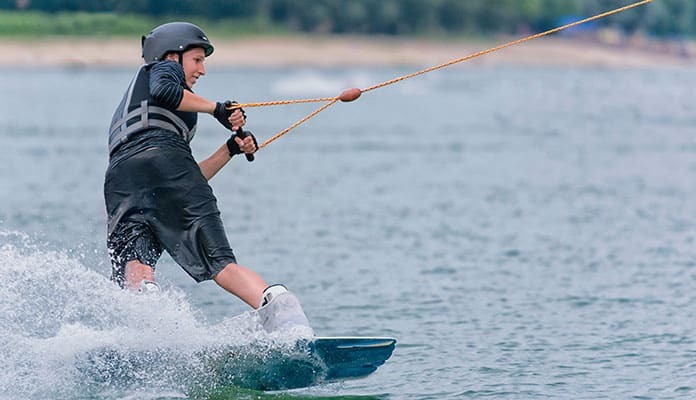 Wakeboarding is a fun boating sport that every adrenaline junkie needs to try. A combination of waterskiing and snowboarding, this summer favourite can be done with or without the use of a boat. Finding the best wakeboards can be tricky, especially with the amount of variety on the market. That is why it is important to do your research in order to ensure you get a quality wakeboard. To help you get the most out of your summer, we have created a list of the top ten wakeboards on the market. A continuous rocker with molded in fins gives you full control over this wakeboard. Delivering a soft landing every time this wakeboard ensures you have a comfortable ride. A lightweight feather core technology allows this board to be incredibly dense and therefore deliver exceptional strength. The best wakeboard is made for showing off as it is an incredibly easy to ride. Designed with beginners and intermediate riders alike, this board is everything you need to have an action packed summer. Great for riders of all riders 155 lbs and up. A multi-channel design runs from the tip to the nose increasing the wakeboards stability and giving the rider much more edge control. This Hydroslide wakeboard has been designed for skill levels ranging from beginner to intermediate. Having a twin tip design allows you to land tricks both ways making this a good board if you often ride switch. A continuous rocker design also gives you ultimate control when carving through the water. The bindings will fit boots from size 5 to 12. They give you a snug feel and all the control you could ask for and feature a lace up design. This is one of the best wakeboards for beginners. No Fear Crux Wakeboard is as stylish as it is fun. This 58 inch model is ideal for riders up to and over 125 pounds making it ideal for children and teens alike. The twin tips don’t limit your ride stance and allow you to practice switch riding. 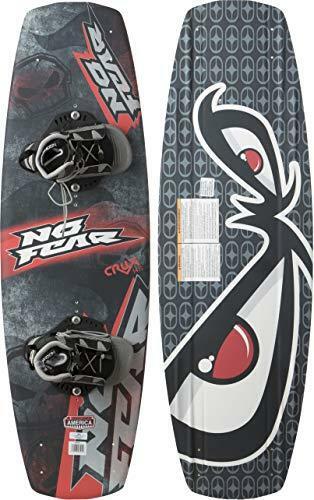 No Fear has done their research and has designed this wakeboard with beginner riders in mind. The shape allows riders to get up with very little effort and cruise along easily. Lace up bindings make it easy to strap in while the included boots are comfortable and durable. Let this be your kids first wakeboard, they are bound to love it! 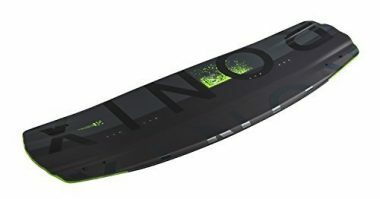 If you are looking for one of the best wakeboards that has expert technology at a stunningly low price then look no further. Suitable for riders of all skill level, this is one of the top all around wakeboard on today’s market. This wakeboard is incredibly easy to maneuver which makes it a great option for beginners while the high class technology appeals to expert riders. The construction of this wakeboard consists of a lightweight Biolite 3 core rocker. This gives the board the strength needed while not compromising on flexibility. This board features a continuous rocker which gives you added speed and ease when carving. A leading edge Tapered Channels design combines with the Dual Fin Configuration to give you more control over your carve in the wake. Look forward to minimal swing weight on rotations on both inverted and flat spins with the boards narrower tip and tail width as well as the thinner profile. Rave makes yet another high quality wakeboard designed to test the limits of all advanced wakeboarders. Ideal for those over 125 lbs this board will ensure you look your best doing tricks and stunts in the water. Coming with Advantage multi-point fully adjustable boots and bindings this board is an amazing deal. The 3 staged rocker with a progressive rounded edge allows you to make all the surface tricks you love while making hard cuts through the waves. This is the best wakeboard that is high end built for those who know what they’re doing out on the water. Liquid Force makes some of the best wakeboards in the world. They use high quality materials and have developed technology and practices that put them in the top echelon of their field. The Shane Dose wakeboard has been designed for intermediate to advanced riders. Features like a wood core, three-stage rocker and finely tuned flex make this one of the best boards available. All of these features allow you to pop the highest and spin the fastest no matter where you ride. This board scores near the top in every category from speed to stability to control. Only using the highest quality materials ensure that this board will stand up to the elements and whatever you ride over. The base is smooth which gives the rider maximum speed and pop at the wake and precise carving ability. You will go where you want and soar for as long as you need when you’re strapped into this wakeboard. 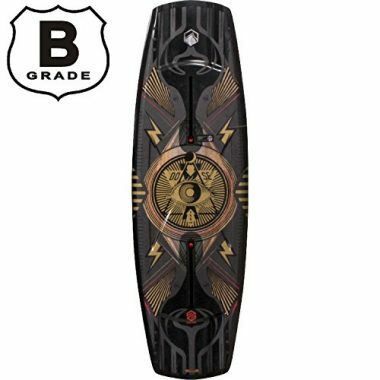 If you are an advanced rider looking to upgrade to the best of the best, this is one of the best wakeboards for you. This is a great wakeboard that is geared towards riders of all skill levels. A great buy for beginners this board will effortlessly take you through to all stages of becoming a professional wakeboarder. The 2018 model is a great improvement on the already great 2016 model specifically delivering better control and stability within the board. This board is great for those who are a little bit hard on their equipment as the durable shell will ensure it lasts for many seasons. This also allows the board to excel in performing jumps and stunts. An impressive 3 stage rocker gives this board an incredibly soft landing making your ride much more comfortable. This wakeboard is designed for adult riders with a bit more skill in the water. Coming with Brandon Bindings this wakeboard gives you everything you need to get out and start enjoying your day on the water. 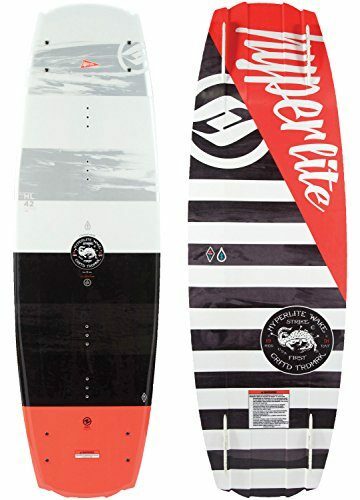 A great option for both intermediate and advanced riders this board will make you look like a professional in the water. The easy to maneuver, forgiving design of the board will make it easier than ever to show off for your friends. A three staged design gives you the control you need to handle this board with ease. Test your limits by practicing some new tricks and jumps with this board and get ready to be impressed by the expert hold of these bindings. 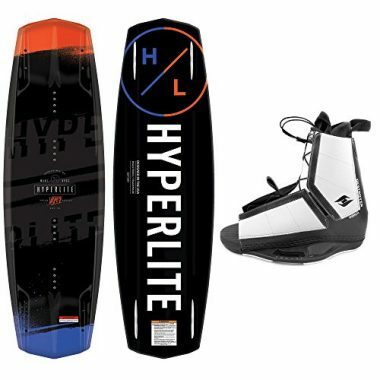 Hyperlite designs great wakeboards. Their Concept board features a four point design that will impress even seasoned veterans. This board is a streamlined version that takes features from their top selling models. The bindings have been specially designed to not have pressure points while offering a secure ride. A fiberglass construction gives you peace of mind no matter how hard you are on your boards. 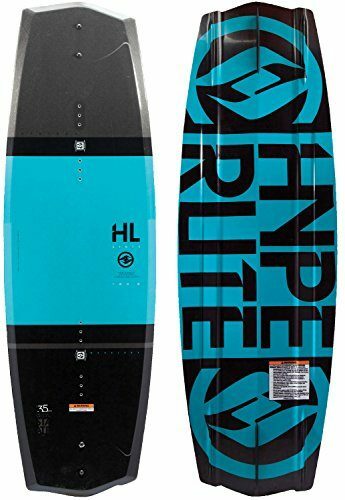 Hyperlite has designed a comfortable, easy to use board that will keep you dreaming about your lines all week. One of the best wakeboards on the market, the Rave Freestyle is a great board for those with a bit more skill. 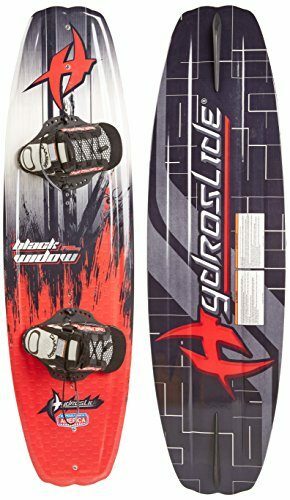 This advanced wakeboard is great for riders over 125 lbs who are looking to try a few more tricks while boarding. Fully ready to take on added jumps and stunts this board will ensure you impress your friends. No need to invest in bindings, this board comes with lace up camo bindings that will give you a comfortable fit that fully supports your ankle. Coming in at an incredibly affordable price this board is a no brainer for riders of all ages. A continuous rocker gives exceptional performance and soft landings. This board features a 4-point design that grips to the water allowing full control during turns and cuts. Most new wakeboarders question what is the best wakeboards on the market. Finding the best on the market and the best wakeboards for you may turn out different results. That is why getting a base knowledge about what to look for in a wakeboard will prove endlessly rewarding. When looking for your next best wakeboard, be sure to pay attention to these few key features. The length of your wakeboard will be based on your weight and skill. Size is measured in centimeters and ranges from around 130 to more than 144. Even though these are the standard ways of measurement there are a couple more factors that can play a role in deciding which size to purchase. Once you become more comfortable on the wakeboard you will start to develop preferences when it comes to what size suits you best. A shorter board will glide over the water slower than its larger counterpart. While they may not glide as quickly, they are experts at doing flips and tricks. Easy to maneuver, these boards do require much more skill to land your board with success. Larger boards are easier to control, thus they are most often used for beginners. The larger surface area allows them to gain extra speed in the water and allows for a faster ride. The large design does lose speed when in the air on jumps and tricks as the size offers a lot of drag. Larger boards are obviously heavier and more cumbersome if you try to do tricks with them. Wakeboards fit into two categories: park and boat. This refers to what you are going to use the wakeboard for. While technically you can use a park board boating and vice versa, you will clearly see that each board has a specific intended use. Specially designed to take the beating of rails and ramps park boards will look and feel different from boat boards. The base of these wake boards will be smooth and reinforced. Edges will be more precise and allow you to take corners sharper since parks are typically on the smaller side. These boards are going to be thin and have a high flex rating. This allows them to be thrown into corners and pop higher since there is no wake. Since boat boards can use the wake surf created by the boat they will have significantly less flex than park boards. This allows for smoother, and easier, landings. Their bases will look different as well. Since you’re not going to be hitting rails or jumps these boards don’t need that reinforcement found on the park board. The newest category of wakeboards is a mixture between park and boat. These wakeboards will allow you to switch up your day if you like. This is perfect if you enjoy both aspects but only have the budget for one board. Their flex will be directly in the middle allowing for just enough flex to take sharp corners and pop with or without wake. Flex has been specially designed as well. The tips will be softer while the middle of the board will be firm. Since hybrid wakeboards will be grinding rails and hitting kickers their base will be reinforced just enough to improve durability. There are many features that you should be aware of before purchasing the best wakeboard. All of these aspects will affect how your wakeboard will ride through the water. This is one of the most important parts of the board. The bottom of a wakeboard can be smooth, channeled, v-spine, or concave. Smooth bottomed boards will give the rider complete control. They are able to spin and pop to their hearts desire. A channeled bottom gives the rider a more smooth landing. The grooves direct the water and can break the water when landing making it much easier on your body. A v-shaped base is typically found on three-stage boards. It allows the rider to carve easier and land the most difficult tricks with ease. Concave boards have circular indents built into their base. This reduces the suction of water, meaning the board will ride higher and gives the rider easier pop. This part of the board describes the shape of the wakeboard. All wakeboards have a curve in their shape. The amount of arc can help or hinder certain aspects of your ride. There are two main types of rockers: Continuous and Three-stage. If you like to stay on the water and enjoy carving with the occasional big air a continuous rocker will be your jam. If this fits you your board will have one large – continuous – curve, hence the name. These wakeboards are fast and easy to handle. Three-stage rockers look a little different. They have a cup shape with a more distinct bend. Known for getting big air these boards are also harder to handle. Their shape makes them harder to control because they don’t have distinct edges to carve through the water. Landings are more difficult and harder on your body. Also, it takes a little longer to get up to speed post-landing. Just like skateboards or snowboards, wakeboards have flex. This describes the amount of bend a board has. Flex can help you get pop off the wake, propelling you even higher into the air. It also aids in carving. Once again, as you get more comfortable on the water you will develop a preference for what feels best to you. Just like surfboards and paddleboards, wakeboards use fins to keep them pointed in a straight line. The amount of features on the bottom of the board will affect the rideability of the board. Typically the preferred fin type depends on skill level and intended use. The larger the fins the less able you are to do tricks. Boards that have these huge fins are typically designed for people learning to wakeboard. They will keep you pointed where you want to go, not let you spin and be more stable. More skilled wakeboarders will want boards with no fins or one with fins around the perimeter of the wakeboard. This will give them the ability to spin into and out of their jumps. Some boards can have fins that can be taken off while other have fins that cannot. Removable fins can be attached by screws and channels. Most wakeboards have two sets of fins. The inside ones are usually detachable while the outer fins are fixed. This gives the rider the most control over the wakeboard and the freedom to choose how their board rides. If your board has removable fins it is important to maintain them properly. Before each ride, you should ensure all the screws are tight. Keep in mind that the fins and screws do not float, so be careful when adjusting them. If you happen to damage your fins you should be able to sand and fill them. Obviously, the detachable fins will be able to be replaced. Q: How To Get Up On A Wakeboard? A: Standing up on a wakeboard can be a difficult thing to master. When you first start out expect to fall a few times before you get the hang of it. You’ll want to ensure your bindings are strapped comfortably to your feet. Next, the boat driver should speed up to around 18 miles per hour. This will be a comfortable speed for you to learn. When you start, be in a sitting position with the board sticking straight out of the water. As the boat starts allow the board to pull you out of the water. When you’re moving shift your feet so your dominant one is in front. From there you just need to shift your weight between your heel and toe to keep your balance. Q: What Size Wakeboard Do I Need? A: The size you should use depends on both your bodyweight as well as your riding style with weight being the primary focus. This isn’t always easy to do as many people buy a wakeboarder for multiple people to use. If this is the case for you, it is wise to go by the heaviest rider. This is because wakeboards become useless if they cannot support the rider’s bodyweight. Children should obviously use the smallest size board (less than 130 cm) while riders bridging quite a bit over 200 pounds should go with a much larger board (140-144+ cm). Most people who lie in the 130-180 pound range should consider sticking in medium ground between 135-140 cm. Typically the longer the wakeboard is the easier it is to ride. Q: How To Jump The Wake On A Wakeboard? A: Once you are quite comfortable on a wakeboard, you will likely want to push the limits of this sport and start performing some tricks. When you have some confidence behind you and can easily turn your board you are ready to start jumping in the air. First you will want to build a ton of speed. You do this by keeping a progressive edge. This means you start slow and begin to build as much speed as possible until you reach the lip of the wave and become airborne. Just before reaching the wake there will be a small dip. Use this time to stand tall and keep your legs straight. This will allow you to use this as a launching point generating more power. As soon as you take off be sure to immediately look for a landing spot to ensure your landing is smooth. Q: How To Pull A Wakeboard? A: Pulling a wakeboard can make it easy or hard for the rider to get up. You should smoothly accelerate your boat to around 18 – 20 miles per hour while keeping an eye on the rider. If they bail out you should slow and stop the boat to make sure they’re ok.
Q: How To Turn On A Wakeboard? A: Turning on a wakeboard is similar to that when snowboarding. You will want to use the long edges of the board to cut into the water. To get the board in the proper position you will have to lean onto your toes and heel. If you have been snowboarding you will pick this up pretty quick. But if you haven’t, you’ll have to have some faith that this will, in fact, turn you through the water. Q: How To Set Up Wakeboard Bindings? A: There are many different stances your wakeboard can be put in. When you are starting out in the sport your feet will have a slight forward tilt. The back binding will be around 0 degrees while your front foot will be around 15 to 27 degree angle. More advanced riders will have their back binding between 0 and 9 degrees and their front one around 18 degrees. Expert riders will have their front bindings setup at 9 degrees and back binding 9 degrees in the opposite direction. Wakeboarding is a fun summer continuation on winter’s snowboarding. Similar to the great conditions of having a mountain full of fresh snow, wakeboarding delivers the perfect conditions every time. A great activity for those thrill seeking, water loving individuals it is bound to keep you fit while being a blast. When reading through wakeboard reviews ensure you are looking for key features such as size, flex and the shape of the board. As this is bound to become an addictive sport, we recommend opting the best wakeboard that will translate seamlessly between a beginner and intermediate wakeboard. New to Wakeboards or have a Wakeboard on our list? Let us know how you like it in the comment section below.